Throughout the 1990s, South Ossetians aggressively pushed for independence from the Republic of Georgia, ultimately seeking reunification with North Ossetia in Russia. Then on the 12th of November in 2006, South Ossetia held a referendum which resulted in an overwhelming “yes” vote for independence from Georgia. In response both the Republic of Georgia, and the international community in the West, ignored the voting results. Why? Because a fairly large oil pipeline ran through the region of South Ossetia and the United States was courting Georgia with NATO membership in exchange for access to that pipeline. Then in August of 2008 Russian forces responded to military clashes between Georgia and South Ossetians in what came to be called the Russo-Georgian War. Most Americans were oblivious to the circumstances leading up to the conflict which led to the common (albeit false) perception that Russia simply invaded Georgia and took a section of their territory against the will of the people who lived in South Ossetia. The November 12, 2006 referendum tells a different story. South Ossetia wanted this, voted for it, and welcomed the Russians as “liberators.” Why? This seems to go against all of our assumptions in the West. The current conflict in Ukraine also has echoes of familiarity. The most recent general election in Ukraine saw the victory of the ethnically Russian half of the country. It wasn’t long before protests and rioting erupted in the capital, mainly sponsored by ethnic Ukrainians, who were supported by the West. After the Ukrainian president was ousted, and the constitution voided in favour of returning to a previous constitution, Russia stepped in to “help maintain security” in the heavily Russian-speaking region of Crimea. While the West considered this an “unlawful act,” Ukraine apparently signed a security pact with Russia years prior that permitted the movement of Russian troops inside Ukraine. Ethnic Russians in the southern peninsula of Crimea overwhelmingly voted “yes” in a referendum to break with Ukraine and rejoin Russia. In what the Ukrainian government and NATO allies termed an “invasion,” Russian forces consolidated control to secure the region and uphold the results of the referendum. Crimeans immediately celebrated. Why? Again, this seems to go against all Western assumptions. It is reasonable to assume that more heavily Russian regions of Ukraine will soon follow Crimea’s example. Ukraine is filled with oil and gas pipelines that provide a large portion of energy to Europe. If half (or all) of Ukraine eventually falls under Russian control, that would make Russia a primary supplier of energy to Europe. So what’s happening here? In short, Vladimir Putin is very cleverly rebuilding the Russian Empire. This is not the USSR, mind you. This is not a godless communist regime. This is different. Baptised in secret by his parents during the Cold War, Putin is cleverly playing his cards as an alleged “Christian” leader. On the one hand, he has used his training in the KGB to rise to the top of the criminal food-chain in the post-Soviet Russia that descended into organised crime after the fall of the iron curtain. Putin now keeps the Russian mafia contained and squarely under his thumb as the master kingpin. At the same time he works toward restoring Russia’s once Christian heritage by building new churches, teaching Russian Orthodoxy in public schools, and giving considerable policy influence to the Russian Orthodox Church. No, this isn’t communism. Whatever Putin is building (or rebuilding), he’s using Christianity as a social foundation, not the failed atheism of the past. Call it what you like, but you can’t call it communism, because by definition, it simply is not. What seems repugnant to Westerners is rather inviting to some Easterners, particularly those with Russian ancestry. So what is drawing people back under Russia’s sphere of influence? It would appear that it’s not just attraction to Russia alone. Rather, a significant aversion to the West seems to be playing a role. So what’s so bad about the West? It doesn’t take much to understand once you look at it from an ethnically Russian point of view. Remember, under the USSR, the Russians were essentially sheltered from the social upheavals that transpired in the West during the 1960s through 1980s. There was never any “sexual revolution” to speak of in the Soviet East. While most Russians do not practise Christianity, the basic Christian moral framework is still present in Russian society. For the most part, people still believe that the best way to live is to work hard, get married, have babies and remain peaceful. So when Russians look to the West, with all of our sexual liberation, and rioting as a form of “protest,” it scares them. They see it as chaos, lawlessness, and downright perversion. Western military excursions into the Middle East, along with US and EU sponsoring of Arab uprisings (which has resulted in the massacre of many Orthodox Christians), hasn’t helped the West’s image much. Throw in the NATO bombing of the Orthodox Christian regions of the former Yugoslavia and the West gets a very bad reputation. 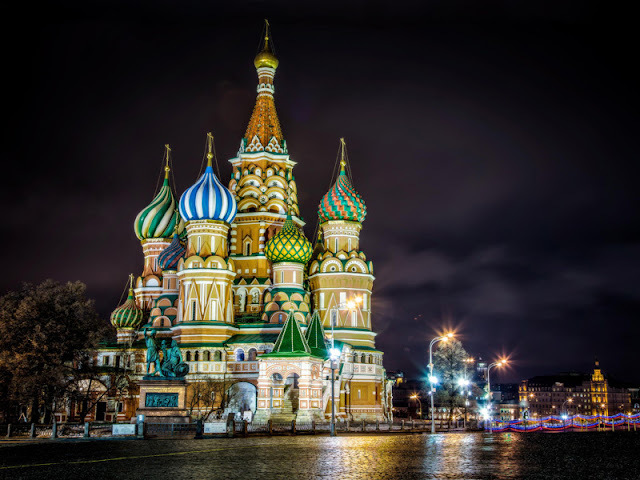 Russia doesn’t have a whole lot to offer people in the way of money and material goods, but it can offer military security, along with plenty of churches, decency laws and solid religious instruction in public schools. Putin is shrewdly offering all this, and Eastern people find it attractive, especially in the face of Western expansion and moral relativism. That’s why they love him, and that’s why regions of various Eastern countries are voting to join with Vladimir Putin in his rebirth of the Russian Empire. It’s probably safe to assume this trend will not end with South Ossetia and Crimea. In the process the West is losing control of pipelines, and with that the flow of oil and natural gas -- particularly into Europe. Yes, Putin is playing his cards very well, and why shouldn’t he? The West unwittingly helped stack the deck in his favour. The years to come will be hard for the West as the ascendency of Russia is impossible to stop at this point. The US and EU have spent all their political capital in reckless finances, sexual liberation, wars and uprisings, along with unkept promises to those Eastern nations foolish enough to believe them (Georgia & Ukraine). Even a recent opinion poll in the UK shows that the majority of Britons have a more favourable view of Russia than the EU. A paradigm shift is occurring right before the world’s eyes, and the West is seemingly powerless to stop it. The Russian Empire is reborn, and every attempt to frame it in the old Cold War motif has failed. This isn’t communism, it’s something else, and the West has no idea what to do. In the years to come Russia will continue to grab more land, and more pipelines in the process. Before long Putin will control most of the flow of oil and gas across the Eurasian continent. Europe and America will be nearly powerless to stop it, you see, because these land grabs will come by the will of the people who live there. It’s easy to villainize Vladimir Putin for this, and certainly he does deserve it to some degree. He’s been cold and uncooperative with the West, but then the West has tried to control him, ignore him and even bypass him. We can lament the mistakes of the past all we want, but that won’t bring back South Ossetia and Crimea. Opportunities have been lost and they’re not coming back. So where do we go from here? Maybe it’s time for the West to do a little soul searching. Since the fall of the Soviet Union, the West has spent a great deal of time and energy manipulating the Middle East in such a way that has been catastrophic to the Christians living therein. NATO has bombed Orthodox Christian regions in the former Yugoslavia, in part, for the purpose of liberating a Muslim region (Kosovo) that appears to now be training terrorists. We haven’t done nearly enough to conserve energy resources and discover new forms of energy. We have allowed (even encouraged) our banks to become insolvent and put the West into the longest recession since the 1930s. Finally, when one would think we would have more important things to look after, we have become obsessed with sexual liberation, in the form of “marriage” for homosexuals, along with artificial contraception and abortion-on-demand for everyone else. The West, and by that I mean primarily Europe and North America, has become decadent, and it is this very thing that has made us weak and pitiful in the eyes of the East. Do you believe in Divine providence? I do. Because for now anyway, it would seem that God is using Russia to chastise the West for its sins and hopefully chide it into reform. The vision Putin offers to Easterners is a narrow one. He offers them a form of godliness but denies its power. He says, “here is a Christian state,” but he enforces it using the ways of the devil -- which is power and coercion. Nevertheless, people are falling for it. They fell for it in South Ossetia and in Crimea. More Ukrainian regions will likely follow. The people will vote in favour of turning to Russia, and then Russia will move in to “accommodate” them. In truth, what Putin offers them is not much, but when faced with Western decadence as their only alternative, many Easterners would rather move toward something more familiar and seemingly “safe.” That trend is not going away. Expect it to spread in the months and years to come. The West has all the tools it needs to beat the Russian bear at his own game, but we’re not likely to use them anytime soon. For now, the West is steeped in materialism, secularism and moral relativism. Of course such ideologies lead not only to sexual license, but also to financial malfeasance and international treachery. So as Russia begins to block the international advance of Western decadence, we can expect to see the West begin to “pick at itself” for a while. Conservative and traditional Christians will bear the brunt of this trend with the loss of freedoms and social ostracism. (Of course that will only lend more credence to Russia’s argument.) In time however, there is hope that the West may eventually begin to understand that the key to defeating Russia at its own game is to up the ante. If Russia thinks it can offer people wholesome Christian living backed by the state’s support of the Orthodox Church, then the West can offer it too, but more Christian and far more wholesome, backed not by the state’s support of a particular religion, but by the state’s support of religious liberty. The West has the Bishop of Rome, the Pope, who could potentially unite Christians in the West (if they are willing) and someday reach a reunification with the Orthodox churches (including the Russian Orthodox Church). In other words, the Fisherman holds the Keys to the future of Western civilisation. The Catholic Church remains the West’s strongest advocate for traditional Christian morality. If Western governments would recognise this, and back it as a means for survival, then that changes the whole game. If Putin can use the Russian Orthodox Church to rebuild a Russian Christian Empire, then the same can be done (but much better and with more freedom) through Western moral backing of the Roman Catholic Church and those churches that morally stand with her. It’s not hard. We’ve done it before. Back during the 1950s it was common to see Hollywood movies in which the Catholic Church, and all churches, were portrayed positively. Governments respected churches and even allowed religious symbols on public property. Laws were generally structured in such a way as to respect the religious sensibilities of the people. etc. Simultaneously, the West can begin utilising the natural resources of North America (oil and gas) far more effectively, while also exploring alternative forms of energy more vigorously. Between the geothermal energy of Iceland and Yosemite, the West could conceivably produce enough hydrogen to fuel automobiles for a thousand years with zero pollution. Then of course, maybe we can start implementing a little charity into foreign relations and stop pursuing policies that result in the slaughter of Orthodox Christians. When these tactics are realised and implemented by Western leaders, some future Russian leader will be forced to come to the table with the West and broker an energy deal that benefits everyone. Until that day comes however, the West can expect to be clobbered by Russia -- not militarily -- but socially, morally and in the realm of international influence. Shane Schaetzel is the author of Catholicism for Protestants (RegnumDeiPress.Com), a freelance writer and the creator of CatholicInTheOzarks.Com, a blog of apologetics and random musings from the Bible Belt.